Neither witch nor devil, thunder or lightening, will hurt a man in the place where a bay tree is. When I was little, my mother used to stash a couple of bay leaves in the flour canisters to ward off the evil weevil. 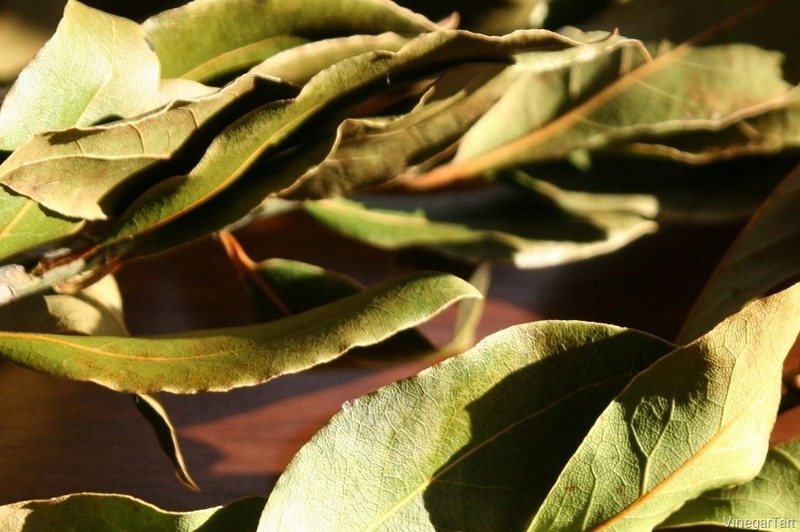 I haven’t thought about that for a while, however, I have been thinking about bay leaves and how to use them in cooking. In deepest, darkest November while in Victoria, I harvested a large bag of bay leaves for cooking and for Christmas decoration. I love the smell of the fresh bay and I am enamoured with this hard to describe flavour. 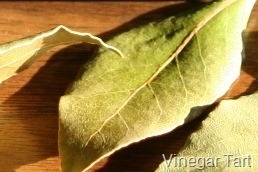 I keep a small handful of bay leaves on hand and use bay as a background seasoning in soups, sauces, stocks. It is also an important herb in bouquet garni. With such a bounty of bay on hand, I reasoned I could experiment using bay in the foreground instead of the background. Well…we will see how that works. Bay laurel (Laurus nobilis), also known as sweet bay, sweet laurel, sweet bay laurel or bayleaves (one word as found in A Concise Encyclopedia of Gastronomy by Andre a Simon) is an evergreen perennial known as, “The Sacred Tree of Apollo.” This ancient plant was well respected in Roman times and the god, Apollo, is represented wearing a bay wreath on his head. The bay wreath became a mark of excellence. The Latin word “laureate” means “crowned with laurels” and we use this word when we confer honours: on poets – poet laureate (Fred Wahl is Canada’s newest parliamentary poet laureate); Nobel prize winners in general are referred to as Nobel laureates. Bay laurel garlands were presented to the first Olympians in 776 BC. I know you have a jar of bay leaves sulking in your spice drawer. You don’t remember buying them let alone what you intended to do with them. I want you to take them out of the jar and smell them. What do they smell like? Dust? Right. Get rid of them. Compost them. Now…go and buy some fresher bay leaves or if you live on the West Coast ask around – your neighbours might have a sacred tree of Apollo. Bay Laurel is not to be confused with Mountain Laurel (kalmia latifolia) which is not suitable for eating. 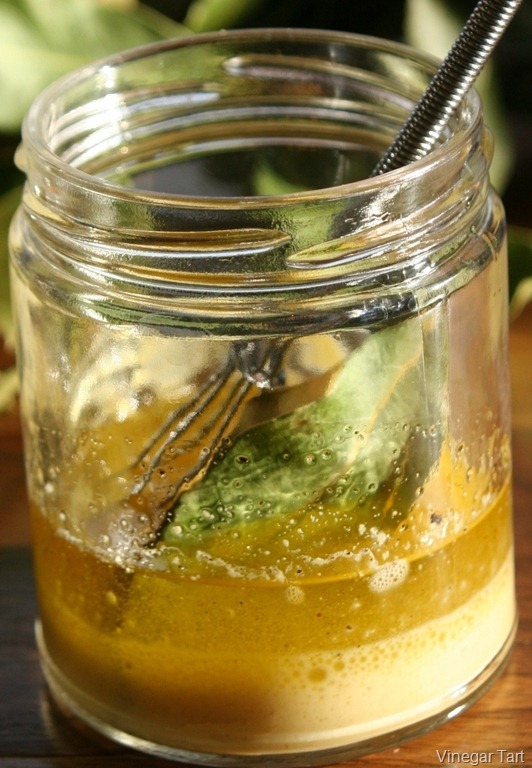 This is a simple and unusual vinaigrette using bay laurel. The bay laurel needs to marinate in the oil and vinegar to release the bay flavour. So, you are not going to enjoy this vinaigrette tonight. This is the first of what I hope will be a few posts using bay laurel. However, given my record over the past weeks, that remains to be seen. Whisk first five ingredients together in a small jar. Add bay leaves and let infuse for at least 24 hours. Discard bay leaves and use remaining vinaigrette.